Submitted by Mike Penn on 26 November 2018. The day started at 4 AM wake-up. Then was a shuttle ride to the USAP at 5:45. We then were weighed and checked in our bags. Then...we were delayed. 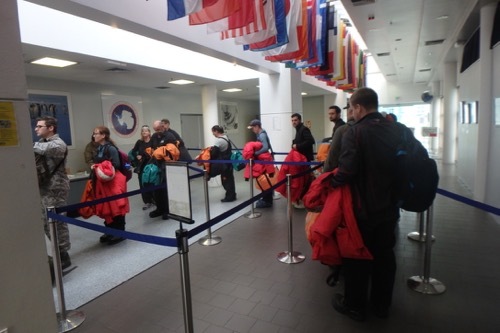 USAP participants in "bag drag" line for boarding flight from Christchurch, New Zealand to McMurdo Station, Antarctica. The rumor was that we were going to be delayed because there was some high winds (19 Knots) at McMurdo. That seemed like a plausible reason for a delay. As usual, the rumor was not true. Well, at least partially. We WERE delayed, but not because of high winds. The official word was that the ice runway was too soft. That caused the type of aircraft to be changed, and THAT caused the delay. Originally we were scheduled for a Kiwi (New Zealand) Air Force Boeing 757. We we were then assigned on a U.S. Air Force C-17. The C-17 is much bigger and heavier than the 757, but the wheels distribute the weight of the aircraft over a larger area, and that is better for landing on softer ice and snow. 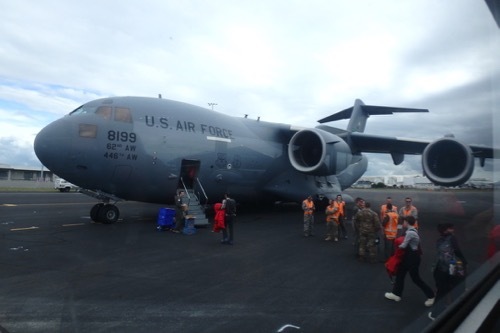 This U.S. Air Force C-17 is loading to take USAP participants to McMurdo Station, Antarctica. The C-17 is a HUGE U.S. military cargo plane. It is built to carry a lot of very heavy things. There were 36 of us aboard as passengers and we sat in seats that folded down from the outside walls of the plane. 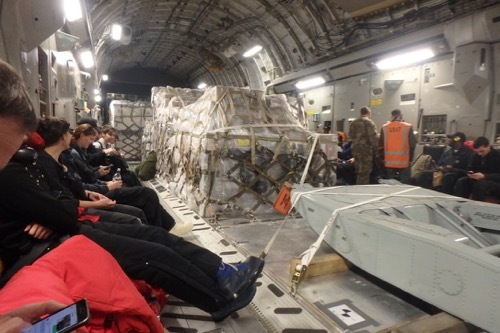 In addition to all of us and all of our gear, there was a LOT of cargo. All of the cargo was organized on big pallets that are about 25 feet long and 15 feet across and about 10 feet high. Each of those pallets were strapped and chained down to the floor. There were three of those pallets. On one of the pallets was an entire boat! Directly in front of my jump seat was a huge ski for the front wheels of that airplane that could be fitted to the plane in case it were to be needed while the plane was in Antarctica. The C-17 is not intended for passenger comfort! It was VERY loud and the seats were uncomfortable especially for our 5 hour flight. Inside of the cavernous U.s. Air Force C-17. Plenty of room for cargo and passengers, but NOT made for comfort. We were allowed to go up into the cockpit where the pilots were flying the airplane! Two of us at a time stood next to the Navigator and Flight Engineer where we could see the pilots at the controls of the airplane. It was impressive to see all of the controls, gages, monitors and switches. The pilots answered our questions and explained what some of the various controls did. 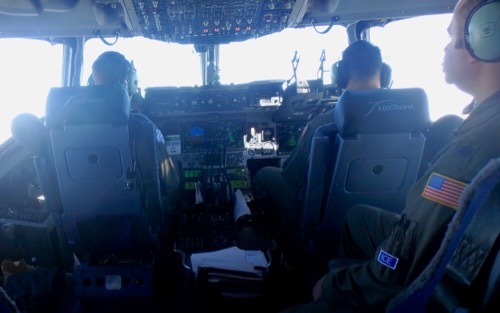 C-17 cockpit on an "Ice Flight" from Christchurch, New Zealand to McMurdo Station, Antarctica. 30 minutes before landing we were instructed to put on all of our Extreme Cold Weather gear. Interestingly, it isn't that cold at McMurdo. It is about 20˚F. That is just slightly colder than it is back in Pittsburgh! The reason that we need to wear the ECW gear is two fold. The first reason is purely practical. It is much easier to carry all 22 pounds of Extreme Cold Weather gear than it is to carry it. The second reason is as a safety precaution. In the unlikely event that the plane would crash during the landing process, we would already be wearing all of our gear. That would be much better than either trying to find it in the wreckage or having to do without in the event of a crash. Stay tuned for my first step onto THE ICE! Did you fly with any of the folks headed to the Dry Valleys? I heard the connectivity is much improved this year. Let's hope. Kevin, I DID fly down with a couple of people who are working in the Dry Valleys, but none of them that are on your team. They knew of Byron Adams and knew that a PolarTREC teacher was going with them! I asked them to keep a lookout for you. I don't know what the connectivity was like in previous years. It isn't very fast and our PolarTREC page "times-out" pretty frequently. It is a little bit better now that I'm hardwired and doing this at 2200 when most other people are going to sleep and there is a little bit of space in the bandwidth. Mike - what was your first impression of Antarctica? What are you most excited about for your stay on the ice? mkhall, Hmmm....my first impression? I'm not sure that I can narrow that down. I was so excited that I had actually made it to Antarctica, it was a long road to get here! I was impressed by the deep blue of the sky and the brilliant white of the snow. I had studied the maps of the area, so I knew where White Island, Black Island, Minna Bluff, Mt Erebus, and Mount Discovery were and I knew how far away they were. It was striking how plainly visible they were even from as far as 55 miles away. Also, seeing Mt. Erebus (an active volcano) so close by, towering above the horizon with a whisp of smoke drifting from the cone was exciting. Mr. peen is there a lot of wind in Antarctica and was the trip to Antarctica windy. Riley, There is a LOT of wind in Antarctica, in fact, it is the windiest continent on Earth! It has been surprisingly calm here in McMurdo for the first two days, but the wind here in McMurdo can get over 100 miles per hour and there are other places that can get up to 200 miles per hours in a katabatic wind. Hello, I am a student from Dansville Middle School and I have a question, What would happen if someone gets sick on the journey while outside nearby McMurdo or inside McMurdo? Brandon, We all had to go through an extensive medical and physical qualification process to try to mitigate the risk of someone having a pre-existing condition that could cause a problem/emergency while they are here. There is a clinic here in McMurdo that has a very limited medical capbility. Out in the field, if someone were to need immediate medical attention...well, the team mates would have to render first aid and call for an air evacuation. That could take a while. There are places here that are 3800 miles from the closest hospital, and even under the best of conditions would take four days to get to a hospital in New Zealand! So...everyone needs to be careful to keep healthy and there is a big effort to minimize the risk of accidents by planning and preparing so that accidents don't happen! But...the best advice is: Don't get hurt or sick! Karley, All of that stuff that was chained and netted down in the center of the airplane was all cargo going to the American bases in Antarctica. I know that one of the crates had a boat in it! There were also large pieces of metal, several large fuel tanks and "Freshies." Freshies are fresh fruits and vegetables. Freshies are a rare and valuable thing here. Since New Zealand is 2415 miles north of here, it is really difficult to get anything here without freezing and once here has to be eaten right away since it can't be stored for very long. Kirk, Hello! Matthew isn't with the team this year, but I did email with him today! Actually the emails that we exchanged were concerning collaborating on a video call for Antarctica Day. Keep an eye on the PolarTREC page for updates, it isn't quite finalized yet. BTW, I knew who you are and I read your journals from your deployment! Thanks for checking in! Hey i was just wondering what cargo do you bring on the plane? Skyler, I'm going to write a journal about our cargo and all of the equipment that was shipped here for our project! Stay Tuned! Hey I´m in Kevin´s class. Is Antarctica Really windy and cold. Marquez, Your question has been a popular one! Please read some of my other responses for the answer to this question. Thanks for reading my journals and taking the time to ask a question. Dylan, The C-17 landed on the Ross Ice Shelf at a place called Williams Field (AKA Willy Field). It is "groomed" by machines that keep it level, but it is pretty level to begin with. When we fly out to service our AWS we will fly in Twin Otters (a small airplane) and that will just land directly on the raw ice. It was a absolutely normal landing in the C-17. It didn't even have skis. That airplane weighs 86 tons empty and it landed on the ice with it's wheels, so the ice is really stable and hard. Dylan, Your question has been a popular one! Please read some of my other responses for the answer to this question. Thanks for reading my journals and taking the time to ask a question. The plane is so cool! As you were nearing Antarctica, was the inside of the plane cold? It was surprisingly warm in the plane, even when we got over Antarctica. Although we were all wearing all of our Extreme Cold Weather gear, so...maybe it wasn't as warm as I think it was! Hey I have been on a C-17 too I agree it is very uncomfortable. Was there a lot of turbulence? Adam, There was virtually no turbulence at all. It was really surprising! It was actually smoother than the commercial flight from Houston to New Zealand. Jasmine, It is so interesting and different from home! Please keep reading my journals to keep finding out more about Antarctica and my project! It looks warmer than I thought. Is it? Ashton, Your question has been a popular one! Please read some of my other responses for the answer to this question. Thanks for reading my journals and taking the time to ask a question. Mike - What time does the sunset usually happen in Antartica? Jaxon, I just looked it up today - the sun won't set here again until February 20th! There is 24 hours of daylight here all "summer" (our winter)! The flight from Christchurch to McMurdo station was 5 hours with no layovers. Thanks for reading my journals and taking the time to ask a question. Was the landing in Antarctica rough? Nope, it was as smooth as any other landing. I was surprised! The food here is surprisingly good! As you probably know, your body needs more food to burn just to keep you warm when it is really cold. So, most of the food here is designed to provide more calories than a similar cafeteria back home. The biggest difference between here and there is that here there generally aren't any "Freshies." Any fresh fruits and vegetables are rare and valuable around here. Also, all of the beverages are...reconstituted. The milk has been powered, shipped here, then the powder was mixed with the correct amount of water and made into milk again...mostly. The beverages have been a challenge to get used to. I'll write more about this in a journal in the near future. I love airplanes and this sounds super cool! was the ride fun? Hey I'm from Kevin's biology class. I was just wondering what you did while you were on the plane? What was one way you fought boredom? Paige, I brought a book! But I wasn't bored, there was a lot to look at! Thanks for reading my journals and taking the time to ask a question! How do you keep the things you brought with you from freezing? I am from Kevin's biology class. Hello i am from Kevins biology class! Have you gotten any sleep since you got there? Tori, Your question has been a popular one! Please read some of my other responses for the answer to this question. Thanks for reading my journals and taking the time to ask a question. Eva, Your question has been a popular one! Please read some of my other responses for the answer to this question. Thanks for reading my journals and taking the time to ask a question! What was it like when the wheels of the C-17 touched down on the ice compared to a asphalt runway? Braden, Your question has been a popular one! Please read some of my other responses for the answer to this question. Thanks for reading my journals and taking the time to ask a question. Hi i'm from kevin dickersons class, I was wondering could you bringing something you want to bring (like bringing a blanket form home or other stuff like that) or can you not. Ashton, We could bring anything we wanted to bring but we couldn't exceed 85 pounds. The USAP provides all of our bedding so that was something I didn't have to worry about! Hi I am one of Kevin's students, and it's pretty interesting learning about Antarctica. In your journal in the Landing section, you said that it was easier to carry all 22 pounds of Extreme Cold Weather gear than it is to carry it. Did you mean it is easier to wear?